Beer is an old beverage, nearly as old as wine. Beer is a beverage brewed from water, malted barley or other cereal, hops and yeast. Pilsner and lager are bottom-fermented beers, the yeast sinks to the bottom. Ales are top fermented, the yeast rises to the top. The two main categories of beer - ales and lagers - are distinguished chiefly by the type of yeast used to turn sugars found in malt, another main ingredient, into alcohol and carbon dioxide. Hops, for flavor, and water form the final two major components. The kind of yeast used during the fermentation process that transforms sugars into alcohol and carbon dioxide is the main determinant factor in brewing a lager or an ale. Even the most avid fans would find it difficult to sample a fraction of the thousands of varieties available worldwide. But all this delightful choice is the product of a small number of single-celled fungi called: yeast. From such simplicity comes the complexity enjoyed the world over. Most of that enjoyment involves consuming lager in one form or another. Lagers use a slow-acting yeast that, in the common case, settles to the bottom of the tank during the fermentation process. Though usually associated with lighter colors, lagers run the gamut from pale to medium or darker. Most are highly carbonated, with medium hop flavor, and contain about 3%-5% alcohol. Fermentation is usually carried out in the moderate temperature range of 7-12°C (45-54°F), then stored at near freezing temperatures for a few weeks to a few months. 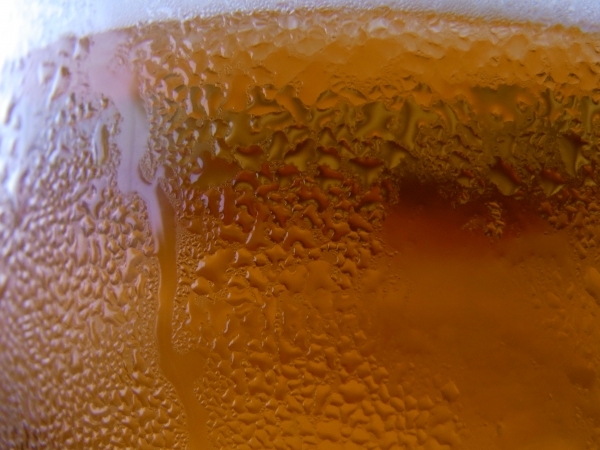 Lagers are typically fermented colder than ales, and later served cold, as well. In the extreme case, lagers are made into a variety called 'ice beer', in which fermentation takes place below 0°C (32°F). Gradually, small ice crystals form and the brew takes on a very light, crisp taste. Like any product that has been around for centuries, there are dozens of sub-categories, and lagers themselves are divided further. For example, Bock is a strong, German type that can be either light or dark. Dortmunder, (unsurprisingly) brewed in Dortmund, Germany is a another example. Munchener is a highly malted Bavarian beer, usually dark. Marzen, from the German word for March, is stored in cool basements for several months then served at Oktoberfest. Rauchbier is made from roasted malts, suffused with the smoke from burning wood. The Vienna is an amber-red. But by far, the most popular isn't German in origin at all. The Pilsner lager gets its name from the town in the Czech Republic that gave it birth, Pilsen. Golden in color, the flavor varies from sweet to dry, light to very hoppy. Made from hard water, the taste is often more bitter than other beers. The brew recipe has its origins in Bavaria around 1820, but was adapted by a Bavarian emigre, Josef Groll, in 1842. Using much softer water than was traditional his creation spread throughout Europe and later America. Today, nearly 90% of beer sold in the U.S. is essentially Pilsner. Whichever is your preference, do yourself a favor and emulate the brewers themselves - experiment. Ale is at the top of the beer pyramid in more ways than one. The type of yeast used in ales is called 'top fermenting' because of its tendency to float near the top of the tank. But, the results go far beyond providing an easy way to filter the brew. Techniques used to make ale go back centuries. With that much time for experimenting, it's not surprising there should be such a wide variety. Pale ale, India Pale, October Ales, Barley Wine, Scotch Ale, Saison, Tripel; the choices are endless. Pale ale, as the name suggests are light, bitter and mild in hops. Originally made from malt dried with coke (a coal product, not the drug cocaine), almost every beer-producing country now has its own variety. A type known as India Pale Ale is derived from a British October, brought to India during the 18th century. Heavier on hops, the preparation method helped preserve the brew for the long sea voyage. Despite the name, Barley Wine is a kind of heavy, sweet beer. An English-style ale, the name may come from the fact that the brew is high in alcohol, often as much as 10% by volume. Special yeasts are used that can tolerate the high concentration and the result is a full-bodied copper to dark brown mixture. Sometimes wine yeasts are, in fact, used. Darker still is the Scottish Ale, with a maltier taste. Though the hops were imported, the Scots produce their own unique style, aided by the colder weather. Some sources put the origins of brewing there as far back as 5,000 years, where herbs were used rather than hops. Two Belgian-style ales have long been favorites outside their country of origin. The Saison, from the French word for 'season', has a spicy, earthy taste that's dry and smooth. Traditionally brewed in small farmhouses in winter, each one had its own unique profile. Some types have an alcohol content as high as 8%. But the very pinnacle of Belgian brewing is achieved by the six Trappist monasteries. Among other brews, they produce the outstanding Tripel. The name derives from the brewing process, in which up to three times the amount of traditional Trappist malt is added. Light golden in color, they're high in alcohol and full of flavor. Forming creamy heads, with rich aroma, they are mildly to moderately bitter. Body is light, thanks to the use of Belgian candy sugar during the brewing. Top of line among Trappist Tripel ales is the Westmalle, produced by the Our Lady of the Sacred Heart, founded in 1794. Some varieties reach as high as 12% alcohol, but the taste - far from being too strong - is that of a heady mixture of malt and hops. Whichever type you naturally prefer, do yourself a favor and emulate the brewers - experiment. Beer is an alcoholic beverage. Alcohol content ranges from 3% to 12% and it is usually ales the ones that are higher in alcohol. Beer styles include lager, malt liquor, ale, Including India pale ale, porter or stout, bock beer, and wheat beer. For the health conscious, there are light beers, with less calories, and non-alcoholic beers. Beer is used in cooking for soups and stews. Substitute beer with chicken or beef stock with a dash of angostura bitter, red wine, or sake when you don't have it and it is listed as an ingredient in your recipe. In parts of eastern Africa you can buy banana beer, brewed from fermented bananas. Explore the world of beer. Liking good wine will help you appreciate a good beer. Beer, innovation throughout the Old World. Beer basic concepts - lambics, lagers and ales. Beer basic ingredients - water, barley malt, yeast and hops. Pouring beer, art or science? Home brewing, 10 steps to perfect brews.